Curando fieri quaedam majora videmus vulnera, quae melius non tetigisse fuit. 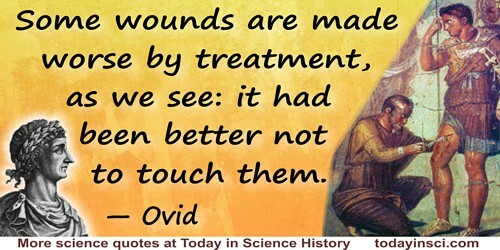 Some wounds are made worse by treatment, as we see: it had been better not to touch them. Quaedam remedia graviora ipsis periculis sunt. 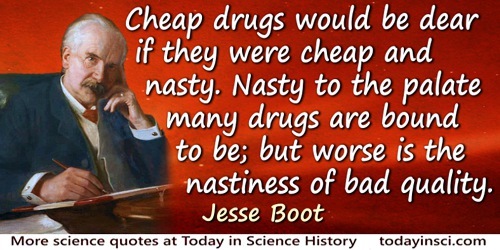 Some cures are worse than the dangers they combat. Controversiae, 6.7. In M. Winterbottom (ed. ), The Elder Seneca (1974), Vol. 1, 520. An enthusiastic philosopher, of whose name we are not informed, had constructed a very satisfactory theory on some subject or other, and was not a little proud of it. “But the facts, my dear fellow,” said his friend, “the facts do not agree with your theory.”—“Don't they?” replied the philosopher, shrugging his shoulders, “then, tant pis pour les faits;”—so much the worse for the facts! From Memoirs of Extraordinary Popular Delusions (1841), Vol. 3, 313, footnote. Anything that the private sector can do, the government can do worse. Archaeology is the science of digging in the earth to try and find a civilization worse than ours. In Evan Esar, 20,000 Quips & Quotes (1968, 1995), 40. In Augustus De Morgan and Sophia Elizabeth De Morgan (ed. ), A Budget of Paradoxes (1872), 2. As quoted in E.P. Whipple, 'Recollections of Agassiz', in Henry Mills Alden (ed. ), Harper's New Monthly Magazine (June 1879), 59, 103. In all likelihood, it is the local conditions of society, which determine the form of the disease, and we can so far think of it as a fairly general result, that the simplest form is the more common, the more paltry and unbalanced the food, and the worse the dwellings are. From the original German, “Aller Wahrscheinlichkeit nach sind es die lokalen Verhältnisse der Gesellschaft, welche die Form der Krankheit bestimmen, und wir können bis jetzt als ein ziemlich allgemeines Resultathinstellen, daß die einfache Form umso häufiger ist, je armseliger und einseitiger die Nahrungsmittel und je schlechter die Wohnungen sind,” in 'Mittheilungen über die in Oberschlesien herrschende Typhus-Epidemie', R. Virchow and B. Reinhardt, Archiv für pathologische Anatomie und Physiologie und für klinische Medicin (1848), 2, No. 2, 248. English version by Webmaster with Google translate. In the wilderness, people think of danger from Indians, alligators, and jaguars. They are not the things you mind. It is the mosquitoes, the poisonous ants, the maribondo wasps that are perfectly awful. It is the borrachudos and plum flies—like the black flies of the north woods, only worse … The day after I threw away my spare clothing ants ate up all my underwear. These were white ants. The driver ants try to eat the man instead of his clothes. In National Geographic, Great Adventures with National Geographic: Exploring Land, Sea, and Sk (1963), 109. The last sentences about the white and driver ants, with slightly different wording, also appear in Theodore Roosevelt, 'A Journey in Central Brazil', The Geographical Journey (Feb 1915), 45, No. 2, 104, previously read to the Royal Geographic Society (16 Jun 1914). Speech, 'The Strenuous Life' (10 Apr 1899), as governor of New York, before the Hamilton Club, Chicago, Illinois. In The Works of Theodore Roosevelt (1926), Vol. 13, Chap.1, 320. Also excerpted in 'Practical Talks by Practical Men: The Strenuous Life', Illustrated World (1904), 2, 87. Mr. Hillaire Belloc has pointed out that science has changed greatly, and for the worse, since it became popular. Some hundred years ago, or more, only very unusual, highly original spirits were attracted to science at all; scientific work was therefore carried out by men of exceptional intelligence. Now, scientists are turned out by mass production in our universities. Technology, when misused, poisons air, soil, water and lives. But a world without technology would be prey to something worse: the impersonal ruthlessness of the natural order, in which the health of a species depends on relentless sacrifice of the weak. Editorial, 'Nature As Demon', (29 Aug 1986), A26. The observer is not he who merely sees the thing which is before his eyes, but he who sees what parts the thing is composed of. To do this well is a rare talent. One person, from inattention, or attending only in the wrong place, overlooks half of what he sees; another sets down much more than he sees, confounding it with what he imagines, or with what he infers; another takes note of the kind of all the circumstances, but being inexpert in estimating their degree, leaves the quantity of each vague and uncertain; another sees indeed the whole, but makes such an awkward division of it into parts, throwing into one mass things which require to be separated, and separating others which might more conveniently be considered as one, that the result is much the same, sometimes even worse than if no analysis had been attempted at all. In A System of Logic Ratiocinative and Inductive (1858), 216. Though all the winds of doctrine were let loose to play upon the earth, so Truth be in the field…. Let her and Falsehood grapple; who ever knew Truth put to the worse, in a free and open encounter? In Areopagitica: A speech of Mr John Milton for the Liberty of Unlicenced printing to the Parliament of England (23 Nov 1644), 35. We seem ambitious God's whole work to undo. 'An Anatomy of the World' (1611), collected in The Poetical Works of Dr. John Donne (1864), 83. When they have discovered truth in nature they fling it into a book, where it is in even worse hands. Aphorism 62 in Notebook E (1775-1776), as translated by R.J. Hollingdale in Aphorisms (1990). Reprinted as The Waste Books (2000), 73.
and what does he, but write a bill? Though you recover, he must break. In Alma Canto III. Collected in Poems on Several Occasions (1709), 262. [To the cultures of Asia and the continent of Africa] it is the Western impact which has stirred up the winds of change and set the processes of modernization in motion. Education brought not only the idea of equality but also another belief which we used to take for granted in the West—the idea of progress, the idea that science and technology can be used to better human conditions. In ancient society, men tended to believe themselves fortunate if tomorrow was not worse than today and anyway, there was little they could do about it. Lecture at State University of Iowa (6 Apr 1961). In Barbara Ward, The Unity of the Free World (1961), 12.